Product prices and availability are accurate as of 2019-04-21 15:52:32 UTC and are subject to change. Any price and availability information displayed on http://www.amazon.com/ at the time of purchase will apply to the purchase of this product. 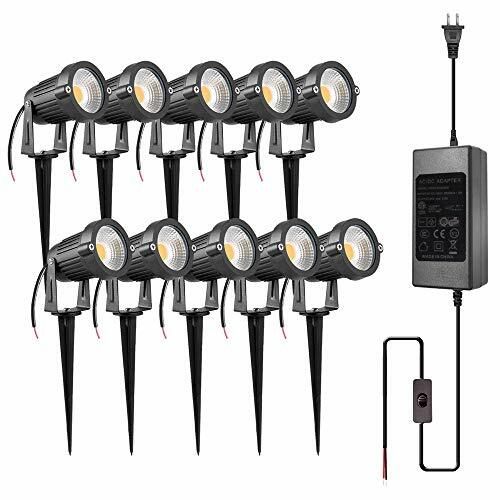 Paint a romantic scene in your backyard garden wall with this quickfit low voltage 5W outdoor landscape lighting , 8 pieces pack set 12V -24V safe outdoor work voltage ,warm white led lights best choice for illuminating your garden pathway ,outdoor step driveways ,flower boxes,Yard Fence and flags . 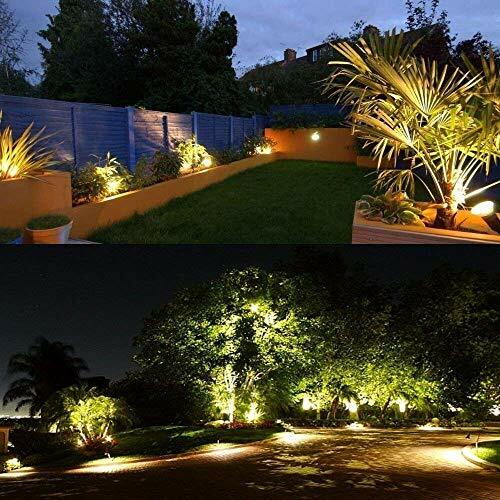 UPGRADE LANDSCAPE LIGHTING LED LIGHT & TRANSFORMER:10 pieces 5W COB LED Light with transformer,500 Lumens per one,great for illuminating your Patio,Garden Path Back Yard fences-not only good for security but also decoration with beautiful warm white lights. 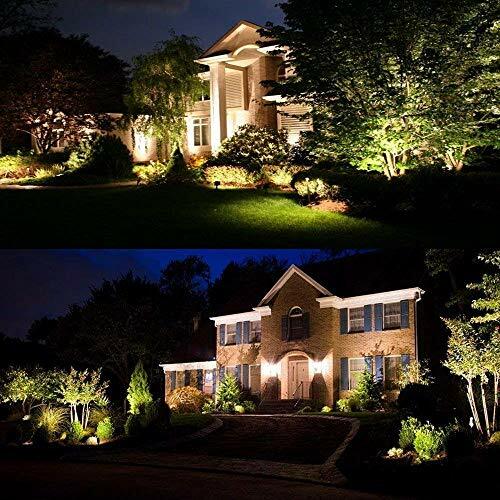 SAFE LANDSCAPE LIGHTING LOW VOLTAGE OUTDOOR USE:12V - 24V working voltage, compatible with most low voltage landscape lighting kits, extra low voltage transformer Required for installation (transformer INCLUDED in this set). 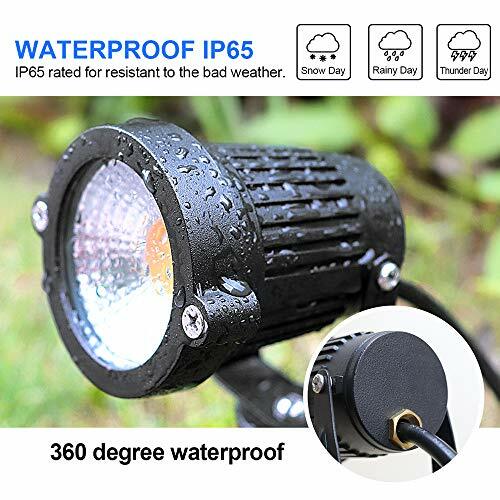 TRIPLE WATER RESISTANT: thick aluminum body and glass lens cover design withstand rainy and snowy weather; IP65 waterproof design which greatly improves the stability of outdoor lighting and long-term use. 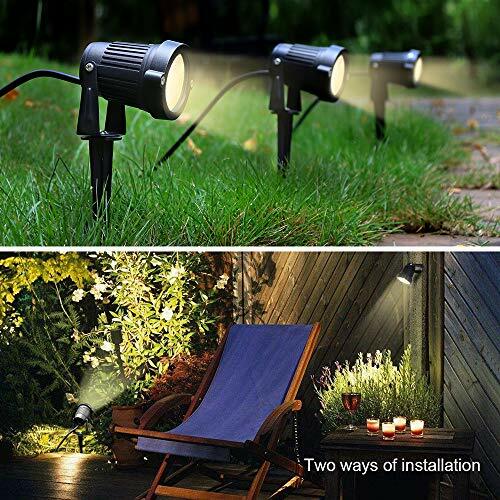 (NOTE:THE TRANSFORMER IS NOT WATERPROOF) ROTATABLE & WIDELY APPLICATED:90° Beam Angle, 270 degree adjustable head offers best lights for the walls,trees,flags &fences;widely used for garden,yard patio pathway,driveway and outdoor decoration. 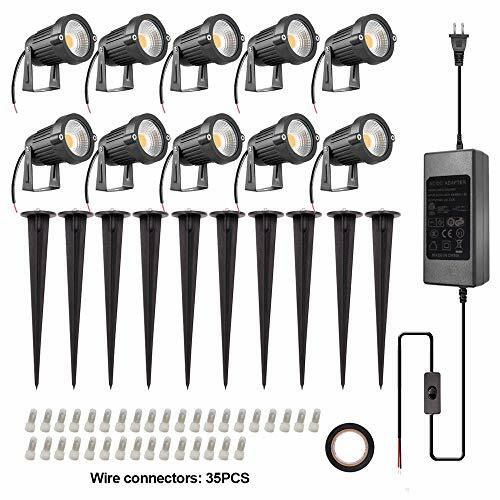 INSTALLATION: Just insert the light spike stand into the suitable position on ground.Extra accessories needed:transformer,wire connectors and low voltage wires( wires NOT INCLUDED in this pack).